"He was not injured. He just didn't know where to run. Another cat ran away, and the policeman said if my cat would have run, he would have let him go." 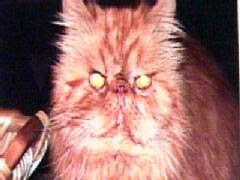 A trigger-happy, cat-hating police officer from the Pittsburgh suburb of Cecil trapped and summarily executed a beloved ten-year-old Persian cat named Elmo on March 22nd. (See photo above.) This barbaric and senseless killing has left Elmo's owner, Roger Oldaker, and his family devastated. Although the details are sketchy and somewhat contradictory, the drama began on March 21st when Elmo disappeared. The following day, an unidentified neighbor, most likely another ailurophobe, telephoned the police to complain about a group of cats loitering on his or her property. The caller also stated that one of the cats was allegedly rabid although it is unclear how this conclusion was reached. The local media, for instance, have not reported any recent incidences of anyone having been either bitten or scratched by a mad cat. Upon the officer's arrival, the other cats scattered but Elmo remained behind. The officer then proceeded in workmanlike fashion to trap the cat, drag it across the street into the woods, and shoot it. Relying solely upon the word of the complainant and the fact that Elmo was not wearing a collar, the officer claims that he deduced that the cat was a stray. He then took the liberty of appointing himself arresting officer, prosecutor, judge, jury, and hangman. Clearly siding with the police, WPXI-TV has refused to divulge the name of the officer and the Cecil Police Department is, as expected, standing solidly behind him. The petit fait that he has been on the force for twenty-five years nonetheless raises serious questions concerning his competence and fitness to wear a badge and carry a gun. First of all, any experienced police officer should have been aware of the fact that there are very few feral Persians. Au contraire, these are expensive cats that usually have doting owners. Secondly, this breed of cats requires constant grooming and the condition of Elmo's fur would have been another rather obvious sign that he belonged to a loving family. Thirdly, the fact that Elmo did not flee upon his arrival was another stark indication that the cat was a domestic. Not that it makes any difference in that nobody should have the right to harm any cat regardless of whether it is domesticated or feral. As it is almost always the case with domesticated animals of all species, it was Elmo's abiding trust in humans that, sadly, led to his brutal murder. "He just didn't know where to run," Oldaker told WPXI-TV in the article cited supra. "Another cat ran away, and the policeman said if my cat would have run, he would have let him go." That is only because he most likely was too lazy to have chased him. Even more disturbingly, cat-lovers in Cecil have to wonder just how many other cats, both feral and domestic, this officer and his colleagues have trapped and shot over the years. By steadfastly refusing to impound Elmo, the officer denied Oldaker any chance to reclaim him. WPXI-TV's slipshod reporting also fails to give any details regarding the final disposition of Elmo's remains. This is important because a necropsy would be able to determine whether he was either injured or rabid before he was shot. Indications are that the neighbor and police officer are lying on both counts. Elmo's tragic death also provides a rare glimpse into the nether world of animal control. Everybody is familiar with the totally reprehensible crimes that occur at shelters and in veterinarians' offices every day but few people are fully cognizant of the monstrous atrocities that are committed by cops, Animal Control, private pest control companies, so-called humane organizations, and evil private citizens. Most notably, trapping and summarily executing cats and dogs is the de rigueur for many Animal Control officers. Untold numbers of animals never make it to shelters and it is unclear whether their deaths are even included in their official kill rates. In some cities, the identities of Animal Control officers are such a closely guarded secret that they can only be contacted by their superiors. They therefore operate with impunity and are totally unaccountable to the public. Much of the same applies to police departments in that as far as it is known they do not make a habit of disclosing the number of cats and dogs that they annually kill. The picture is further muddied by the fact that in some jurisdictions police officers are assigned to Animal Control. Some cities also outsource animal control services to private concerns that are paid a bounty for each animal that they trap and kill. This morally repugnant scheme therefore encourages the illegal killing of innumerable cats and dogs each year. All of these cases point to the inescapable conclusion that both policemen and Animal Control personnel are largely above the law and that the anti-cruelty statutes are too lax in order to bring groups like PETA, the RSPCA, and pest control companies to justice. Private individuals likewise usually only receive slap-on-the-wrists' fines as punishment for their crimes. For whatever it is worth, both Boland and Bolek in League City as well as the Parker-Brices in Ruislip have initiated legal proceedings against the killers of their cats. This is an option that the Oldakers in Cecil also should seriously contemplate. The brutal and uncalled for slaying of Elmo was nothing short of cold-blooded murder and the offending officer should be arrested and tried accordingly. That, of course, is not about to happen anytime soon but when it comes to enshrining the rights of animals in the criminal code someone has to get the ball rolling and Oldaker might very well be just the person for the job. Cats and dogs enjoy a special place in both the hearts and lives of not only their owners but also with anyone who ever has been blessed with owning one of them. In particular, they are such intimate family members that provisions are often made for them in their owners' wills. Bird and wildlife proponents, envious of these relationships, are laboring night and day in order to undermine the rights of both cats and their owners. More importantly, the only sure-fire method of putting an end to the killing of cats such as Elmo, Butty, Mork, and thousands of others like them is to outlaw the killing of all cats regardless of their circumstances. Not only is killing cats indefensible, but as long as it remains legal there is not any way of guaranteeing that beloved pets are not going to continue to be accidentally terminated. Photos: Roger Oldaker (Elmo), Shelley Bolek and Patrick Boland (Butty), and Katherine Parker-Brice (Mork). "If I don't take them in, the government will kill them. I keep all the cats in my house and one-hundred of them sleep in my bedroom at night. I am too frightened to let them out. If they go outside, they will be taken away and killed." While both the government and people of China are being justifiably condemned for not only their long history of abusing and killing cats but for more recently slaughtering them en masse during the run-up to the Summer Olympics, a handful of dedicated cat-lovers are putting their lives on the line every day in a heartfelt effort to save as many of them as they can. One such courageous individual is Hu Yuan. "If I don't take them in, the government will kill them," she told the Daily Mail on March 8th. 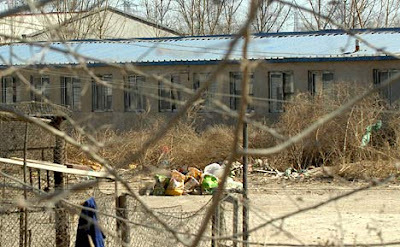 (See "Olympics Clean-Up Chinese Style: Inside Beijing's Shocking Death Camp for Cats.") "I keep all the cats in my house and one-hundred of them sleep in my bedroom at night. I am too frightened to let them out. If they go outside, they will be taken away and killed." She also does not believe one word of the government's outrageous claim that the cats are being killed because they carry infectious diseases. "Look at me!" she exclaimed. "I live with them twenty-four hours a day, seven days a week, and I am very healthy." In Shanghai, retired herbalist Duo Zirong has rescued more than fifteen-hundred cats during the past twelve years and she has the scars and depleted wallet to prove it. For example, in July of last year, a friend of hers shelled out $712 in order to purchase the lives of eight-hundred-sixty cats that were destined for the pot in Guangzhou. Like cats everywhere, some of her charges are healthy and adoptable while others are chronically ill and therefore require extensive medical attention. Plus, caring for that many felines requires an inordinate amount of cleaning and sanitizing as well as socialization and nurturing. It is also expensive. Duo spends around $4,277 each month on food alone and that is in addition to the $969 that she and her husband pay in rent. She also must pay for vaccinations and sterilizations out of her own pocket. It therefore is not surprising that she already has run through about $285,164. "I just can't tolerate other people or animals living in misery," she told the Shanghai Daily on July 11, 2007. (See "Cat City - Cat Woman - Cat Crisis.") "That makes me heartbroken." Since she has the misfortune to reside in a country that is so abysmally backward that it does not have a single anti-cruelty statute on the law books, Due is swimming against the current. The disturbing fact that the vast majority of her fellow citizens look upon cats as either bargain-basement mousers or as a means of getting rich quick through the sale of their flesh and fur, does not make matters any easier either. Most notably, she is constantly being harassed by governmental officials who seize and kill any of her cats that they discover roaming outside her residence. Other bureaucrats even have cut off her water and electricity in an effort to get rid of both her and her cats. The most flagrant abuse, however, emanates from private citizens who not only capture and kill her cats, but also have made threats against her life and repeatedly attempt to extort money from her. In one particularly horrific incident back in 2004, her mother-in-law lost her sight when she was severely beaten in an extortion attempt. "People hate my cats, and they kill them, cut off their tails, gouge out their eyes, and drop their bodies at my door," she told the Shanghai Daily in the article cited supra. "Sometimes I feel like I'm going crazy, but I would hate to part with my cats." Malicious juveniles who get their kicks by preying upon cats are another major problem. In fact, it was the brutal hanging of a white cat by a group of kids back in 1996 that proved to be the catalyst for Duo's activism. "I remember the day. He was hanged on a tree, beaten by wicked children. His eyeballs fell out and blood was everywhere," she recalled for the Shanghai Daily. "I scared away the children and saved the cat, my first cat. I untied him off the tree and brought him home. I had to shoulder the responsibility." All of the abuse heaped upon Duo has turned her and her husband into vagabonds in that they often are forced to change residences. Ethnic bigotry sans doute also figures into the equation somewhere in that she is a transplanted member of the Dawoer minority from Inner Mongolia. Even though she is forced to live in almost constant fear, she is nonetheless somehow able to summon the courage and resources in order to persevere. This is in spite of seldom being able to get more than three hours of kip a night due to her weighty obligations. "All I want is peaceful coexistence of man and cat," she insists. Au premier coup d'oeil, that does not seem like too much to ask, but as events all over the world have proven time and time again when it comes to cats nothing can be taken for granted. Although they have many dedicated defenders like Duo, they also have attracted some very nasty and unscrupulous enemies. 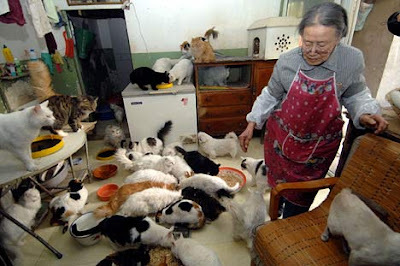 Chu, who owns sixteen cats and seven dogs that she rescued from the street, also feeds about thirty ferals from her neighborhood each day. 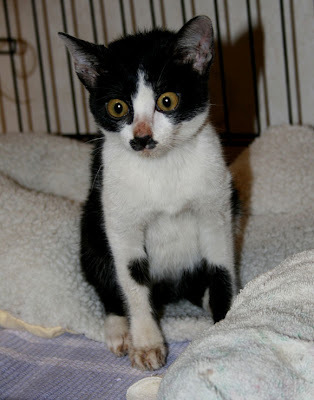 The cats are vaccinated and sterilized and an effort is made to find homes for those that are adoptable. The remainder are either returned to the street or, if space is available, go to live with Chu and her family. "We keep the not-so-pretty and sick animals for ourselves," she told The China Post on April 3, 2007. 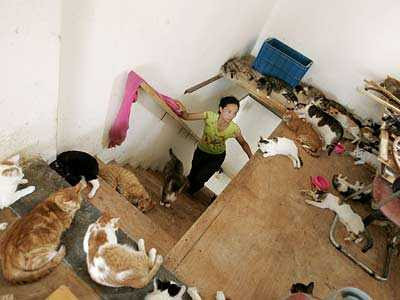 (See "Taipei Woman Adopts Strays, Treats Cats as Family.") "This method (TNR) is a much cheaper alternative than the current method in Taiwan of trapping the animals and destroying them if no adopter is found after ten days of having been in foster care." While the advisability of keeping large numbers of cats under one roof is debatable, it is still far preferable to mass exterminations. Cleanliness and medical care are paramount, however. The Chinese's attitude towards cats is slowly beginning to change even though recognition of the fact that they are sentient beings endowed with inalienable rights is still in its infancy. In the meantime, whether it be scrapping with the authorities and ailurophobes, trudging to feeding stations in all sorts of inclement weather, or taking food off of their own plates in order that hungry cats may eat, individuals who are daring to care about animals are establishing a new standard that is saving precious lives. Photos: Daily Mail (Hu), Shanghai Daily (Duo), and The China Post (Chu). "People don't want to keep cats in Beijing anymore so they abandon them or send them to the compounds...We do not believe any of the cats that go in there survive. They are like death camps." In order to gain the public's support for this act of sheer barbarism, the authorities erroneously have branded all cats as potential disease carriers and this in turn has prompted frightened citizens to each day dump hundreds of domestic cats in the street. These cats, along with ferals, are then trapped by special collection teams which either kill them on the spot or transport them to the death camps. Moreover, house cats fare even worse than ferals under these deplorable circumstances. "It is the abandoned pets that suffer the most and die the soonest," Yan added. "Most refuse to eat or drink and get sick more quickly than the feral cats." In particular, this blatant falsehood is employed time and time again all over the world in order to justify the killing of perhaps as many as one-hundred-million homeless cats each year. The United States alone is guilty of exterminating an estimated fifteen-million of them annually. Nonetheless, Yan's group was able to secure the release of thirty cats from a compound in the district of Shahe in northwest Beijing. Unfortunately, about half of them were in such bad shape that they died within days of their reprieves. The fate of the remainder of the cats is unknown. Tant pis, the government's campaign of demonization has been so successful that even ordinary citizens have begun taking matters into their own hands. Par exemple, teachers at a kindergarten for the children of workers at a cigarette factory recently suckered six cats, including two that were pregnant, into traps baited with tuna and subsequently bludgeoned them to death. Although the Olympics are the primary motivation behind the carnage inflicted upon these totally innocent cats, the Chinese's legendary cheapness is another factor. Specifically, many of them are too tightfisted to pony up the $28 required to have their cats sterilized. Christie Yang of Animals Asia has not been the least bit hesitant to condemn the government's unconscionable crimes. "We understand that with the Olympic Games the Beijing government is eager to show the world the city in a good light," she told the Daily Mail. "But capturing and dealing with cats in such an inhumane way will seriously tarnish the image of Beijing and the games." While it would be inaccurate to state that China does not care one whit about what the world thinks of its animal rights record, it nevertheless is not about to mend its evil ways just because of international censure. Moreover, its crimes against the animal kingdom are by no means limited to cats. In addition to cats, the authorities in Beijing also are sweeping the streets clean of the homeless and beggars. In particular, they are either being forcibly removed to camps outside the metropolitan area or given tickets back to the rural enclaves from whence many of them have come in the first place. As heartless and inhumane as that is, such behavior is by no means confined to Beijing. Au contraire, it is de rigueur in the so-called civilized Western world. For example, earlier this year Nicolas Sarkozy ordered a homeless camp in central Paris to be destroyed. In the United States, the homeless are treated far worse than mass murderers and terrorists in that they are summarily evicted from the sites of Super Bowls, political conventions, and other important events. Although it is tempting to call for a boycott of the games because of China's slaughter of innocent cats, that would be hypocritical. In 2004, Greek authorities poisoned and killed thousands of cats and dogs in the run-up to the summer games in Athens and, with the notable exception of Greek Animal Rescue Canada, scarcely a word of protest was said against it. Moreover, the Western world's treatment of cats is every bit as deplorable as that of the Chinese. In Old Blighty, for instance, the newspapers are chock-full every day of horrific stories concerning cats that have been maimed by BB guns, doused with acid, and mutilated in a thousand other barbaric ways. (See Cat Defender posts of May 7, 2007 and September 25, 2007 entitled, respectively, "British Punks Are Having a Field Day Maiming Cats with Air Guns but the Peelers Continue to Look the Other Way" and "Acid Attack Leaves Solskjaer with Severe Injuries and Horrific Pain as His Heartbroken and Cash-Strapped Family Struggles to Cope.") Exacerbating matters further, the authorities steadfastly refuse to take animal cruelty cases seriously. 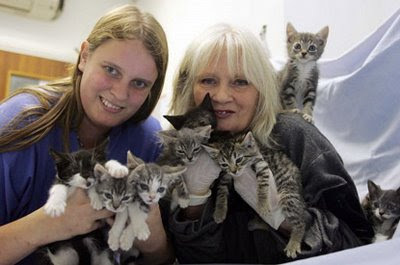 As of March 19th, Hammond and her dedicated staff had managed to rescue one-hundred-eighty-six cats and kittens. 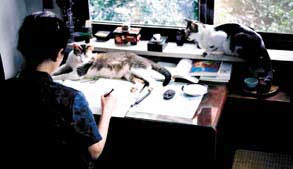 (See photo above on the right of two rescued cats and the one immediately below of Hammond and veterinary nurse Louise Russell with some rescued kittens.) According to the organization's web page, only a few cats remain on the site but they have been so traumatized by the collapsing buildings that they are therefore extremely difficult to trap. Furthermore, the ODA has not disclosed either how many cats it has killed in Stratford or if it has any contingency plans in situ in order to save those cats now residing at alternative venues in Birmingham, Manchester, Newcastle, Glasgow, and Cardiff. Of course, killing and maligning cats is not anything new. No animal down through history has been treated half as horribly as Felis domesticus. Considering the culpability of all nations in the gross violation of both animal and human rights, the international community therefore needs to either clean up its own act or to just forget about staging events such as the Olympics. Besides, if cities such as Athens, Beijing, and London feel compelled to kill cats and dogs en masse and to give the heave-ho to the homeless and the poor, the games are not worth presenting in the first place. Moreover, the games may have become too politicized to any longer be a viable undertaking. Anyone who was alive back in 1972 vividly recalls the abduction and massacre in Munchen of eleven members of the Israeli Olympic team as well as a German policeman by the Palestinian group, Black September. This time around Tibet is the pot that is boiling over and should the unrest spread to Beijing the games will have to be either moved or canceled. Nevertheless, anyone willing to sign a petition condemning the slaughter of cats and dogs in Beijing is encouraged to do so at www.katzencontent.com. Photos: Daily Mail (Da Niu Village and injured white cat), CHAT (London construction site and pair of rescued cats), The Evening Standard (Hammond and Russell with Kittens), and Dominik Baumann of Blick Zeitung (cat that was gunned down in Switzerland). "It's just amazing she survived." There is a very good reason why cats are said to have nine lives. Between the evil deeds done to them by ailurophobes as well as their own penchant for misadventures, they certainly need all of them just in order to survive for a few precious years on this earth. Malli's epic journey began February 4th when she, then about six-weeks-old, became trapped inside a shipping crate in the Malaysian port city of Johor Bahru. The ship sailed three days later and did not dock in Los Angeles until February 25th. From there the crate was transported overland by truck to Cleveland where it was opened by employees of Samsel Supply on March 7th. Inside they found not only Malli but the remains of her mother and siblings who had perished during the long trip. Despite her rough introduction to this wicked old world, all indications are that she is going to be just fine. She is currently being quarantined at CAPL but if all goes well she will be a free cat again in a few weeks. As extraordinary as Malli's saga is, it is far from being unusual. Quite a few cats, as well as other animals, get trapped inside shipping crates each year but they seldom make the headlines due to the simple fact that they usually do not come out alive. All of these stories make great copy for newspapers but the fact remains that if either the shipping companies or the cats' owners had acted more responsibly in the first place none of them would have been forced to suffer. Being diminutive creatures who live close to the ground, cats are not only afraid of loud noises but also of scurrying feet overhead as well. Consequently, they have a tendency to seek security in small places when their environment becomes hectic. For domesticated cats this could could mean fleeing into a shipping crate or a moving van in order to escape the hustle and bustle churned up by movers. For homeless cats, such as Malli's mother, it could entail seeking a warm and dry place in order to give birth. The lesson to be learned from all of these cats' misadventures is that shipping companies should always check their crates for cats and other animals before sealing them. Operators of such ubiquitous modes of conveyance as cars, trucks, and vans should likewise check their vehicles for animals hiding inside. Finally, if foreign companies are unwilling to take steps to ensure that their cargo containers do not contain any cats, American importers should insist that they do so as a precondition for doing business with them. After all, a number of importers have publicly acknowledged that they often find dead animals inside consignments. Photos: Steve Trueman of CAPL. "Everybody is so concerned with animals. But where were all the people when this poor animal was stuck on the telephone pole?" It is a pathetic commentary on the conduct of both public officials and the animal protection community alike when a cat trapped atop a telephone pole is ignored by everyone except an avowed cat-hater. As hard as that is to comprehend, it nevertheless was the no-win predicament that a cat in Stevinson, California found itself in back in January. To make matters worse, this story does not have a happy ending. After being stranded atop the pole for at least four days, the cat succumbed to the cumulative effects of hunger, dehydration, fatigue, and the biting cold and plunged to its death on January 22nd. Among the agencies contacted by Burns were: the Merced County Fire Department in Stevinson, Merced County Animal Control, Stanislaus County Animal Services, Merced County Sheriff's Department, Livingston Police, Merced and Turlock irrigation districts, Pacific Gas and Electric, numerous animal rescue groups, local newspapers, and even a Sacramento television station. "I called every agency you could imagine," Burns said. "I've got an entire page of phone numbers people gave me." Unfortunately for the cat, all that Burns received for this effort were lies and the runaround. The Merced Fire Department even had the audacity to inform him that it did not own either a ladder or a cherry picker! A dog owner himself, Burns makes no bones about his dislike for the feline species. "To be honest, I don't like cats," he declared to The Bee. 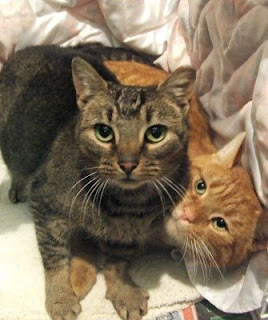 "My ex had two cats, and in order for us to stay together, I had to deal with them. This one looked like one of my ex's." Nevertheless, he does not like to see any animal suffer and the lack of concern demonstrated by the authorities has left him disillusioned. "Everybody is so concerned with animals. But where were all these people when this poor animal was stuck on the telephone pole?" That one is a no-brainer. Like most public officials nowadays, they were sitting on their fat, lazy fannies counting all the welfare money that they have so adroitly cadged from gullible taxpayers. Historically, rescuing stranded cats has been the responsibility of fire departments, but in recent years most of them have become too derelict in their duties to be bothered. Their gross negligence consequently is not only costing feline but human lives as well. Trained as a firefighter but working as a foreman at USS Cal Builders, Buehler was able to get his arms around the cat but, tragically, the branches on which he was standing gave way and he plunged to the concrete below. The unnamed cat suffered minor injuries when she fell with him but is expected to live. Once again, the local fire department's refusal to do its job cost another life. "When cats get hungry, they typically come back down," Captain Ian MacDonald of the Orange Fire Department opined for The Orange County Register on February 28th. (See "Man Who Died Trying to Help Cat Was Experienced Climber.") That fatuous statement is patently untrue as incidents in Stevinson and elsewhere have repeatedly proven. MacDonald then proceeded to defend his department's rank cowardice and bone-laziness by declaring, "Also, laddering a tree has a level of risk involved. Knowing that the cat will come down, we don't take unnecessary risks." Since firefighters risk their lives on a regular basis by entering burning buildings and in disposing of hazardous materials, rescuing a stranded cat should be a piece of cake for them. What MacDonald is saying in effect is that the life of a cat is not worth saving. Even more shockingly, he also is implying that the lives of good Samaritans like Buehler are not worth saving either. "He was a great guy -- easy going, liked to be around friends and would always make you feel welcome," is how roommate Dante Maddox eulogized Buehler. In this instance, Animal Care Services belatedly did decide to take action but its officer arrived on the scene after the fact. Better late than never does not count when lives at stake; the officer should have been dispatched forty-eight hours earlier. Animal Services were initially summoned but they right away pleaded nolo contendere due to a lack of proper equipment. Since stranded cats are such a common occurrence, concerned citizens have a right to know why the agency was so unprepared to deal with this emergency. The local fire department was then contacted but it first demurred by saying that it was scared to death of cats. When it finally did show up, the ladder that it brought along was too short in order to reach the cat. It is difficult to believe that any halfway intelligent person would put up with such deliberate lies and nonsense. First of all, anyone who confesses to being afraid of a cat is either a liar or has no business of being a firefighter in the first place. Besides, with all the heavy coats, gloves, and masks that they deck themselves out in a cat would have a dreadful time locating any flesh to tear into even if it were so inclined. Secondly, since all fire departments from time to time are called upon to battle multi-story blazes, they quite obviously have ladders of all lengths and descriptions at their disposal and to contend otherwise is a barefaced lie. As was the case in Orange, the local authorities' abdication necessitated the intervention of two employees of the library who scaled the tree and shook the cat down into a bed sheet. At the corner of Old Scugog Road and Milville Avenue in the Hampton section of Clarington, Ontario, an orange and white stray cat named Hydro One spent at least two days trapped atop an electrical pole last month. Compounding matters further, the weather was extremely cold and the cat was perched precariously close to live electrical wires. Animal rescue workers and the local fire department were contacted by concerned residents but they refused to act because of the live current. 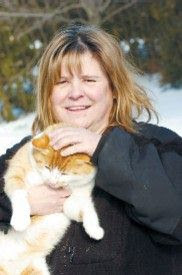 Tammy Twiddy, who regularly feeds the cat, then contacted the local utility company, Hydro One. Speaking of the rescue effort, Twiddy told Clarington This Week on February 21st, "It's amazing how many people have been coming and leaving food" to try and get him down. (See "Much A-Mew About a Cat.") "Normally, every morning he comes to the door for something to eat." On the Isle of Man, a thirteen-year-old black house cat named Mogel had an almost identical experience to Hydro One when he became trapped atop a thirty-five-foot-high electrical pole on or about February 18th. (See photo below on the right.) Likewise, only a a few precious inches stood between him and sure and certain death in the form of cables carrying thirty-three-thousand volts of deadly electricity. In marked contrast to American and Canadian authorities, the Manx Electricity Authority (MEA) did not hesitate to cut power and dispatch a crew in order to rescue Mogel. Moreover, the utility urges residents not to attempt such rescues themselves but instead to telephone for assistance. 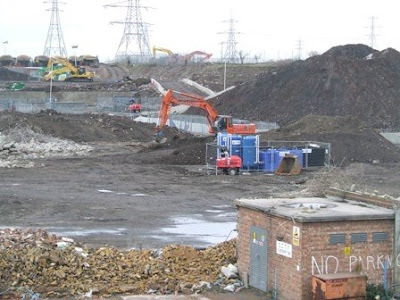 "Live electricity can jump across a gap and he would only need to have got a bit closer to the wires to be electrocuted," MEA engineer Alan Capon told Isle of Man Today on February 18th. (See "Mogel the Cat Avoids a Fur-Raising Shock.") "Fortunately for Mogel he remained far enough away from the conductors." Francisco Hernandez, superintendent of Susan Manor in Asbury Park, New Jersey, found out firsthand just how difficult it is to get help for animals whose lives are imperiled when a kitten became stranded up a tree on March 5th. To begin with, the fire department, SPCA, and Humane Society all gave him the cold shoulder. "No one was able to help," he told the Asbury Park Press on March 8th. (See "Public Works Department to the Rescue for Stuck Kitten.") "They either didn't have the right equipment or they couldn't come." Hernandez was not, however, deterred by their abdication of responsibility. "You just feel bad for an animal stuck like that," he said. A telephone call to the police put him in touch with the Department of Public Works (DPW) which in turn borrowed a cherry picker from a tree surgeon in neighboring Tinton Falls. 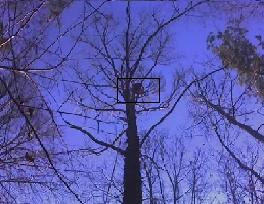 By the following afternoon, DPW supervisor Frank Canella and his crew had the kitten down from the one-hundred-foot-high tree. "They did a great job," Hernandez later told the Press. "I have to thank the cops, too. They really took an interest." Other than being hungry, dehydrated, and frightened, Topper came through his perilous ordeal pretty much unscathed. In the event that his owner does not come forward to reclaim him, he may have found himself a new home. 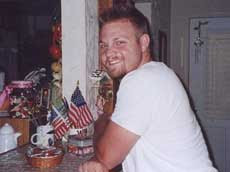 "My daughter, wife, and son have become attached to him," Hendrickson confessed to WTVC-TV. In February of last year, Christopher and David Drake were forced to rescue a cat named Stinky from a rooftop in New Albany, Indiana after the local fire department could not be prevailed upon to mount a rescue attempt. (See Cat Defender post of February 20, 2007 entitled "Stray Cat Ignominiously Named Stinky Is Rescued from Rooftop by Good Samaritans After Fire Department Refuses to Help.") Like the Hendricksons, the Drakes were at last report considering adopting Stinky. With public servants pursuing their own agendas and animal rescue groups largely out to lunch on this issue, concerned animal lovers more and more are being forced to rely upon their own devices in order to rescue stranded cats. They have recently however picked up an important ally, however, in the person of twenty-eight-year-old Marc Matthews of Morris Cove, Connecticut. 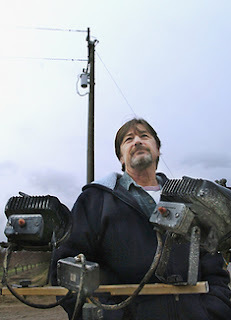 As owner and operator of Connecticut Tree Care, Williams quickly became acquainted with the the plight of stranded cats. Having a Siamese and a pit bull as housemates did not hurt either. Out of those peculiar circumstances, Marc's Cat-in-a-Tree Rescue Service was born. More astonishingly, this is a free service in that he is donating any gratuities that he receives from grateful cat owners to animal rescue groups. "There's nobody around to do it," is how he described his motivation to the New Haven Register on September 24, 2007. (See "Local Man Establishes Cat-in-a-Tree Service, for Free.") "I can't see leaving them up there when I have the skill to get them down. Not everything is about money." Although Williams also gladly returns fallen baby squirrels to their nests, cats are the big beneficiaries of his service. "There is a real need for this and I think it's wonderful that instead of charging he's donating to animal rescue organizations," Eunice Lasala of the feline rescue group, Branford Compassion Club, told the Register in the article cited supra. While Williams' highly commendable work is no doubt having a big impact upon the lives of stranded cats in the New Haven area, the fact remains that there are not many people like him on this earth. Meanwhile, cats and those who attempt to save them are continuing to die needlessly. The conduct of fire departments across the land is reprehensible. Since they have the equipment and expertise, they are the logical candidates to rescue stranded cats. The same logic applies to utility companies. 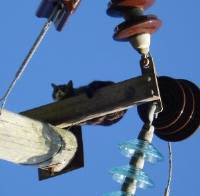 When cats become stranded on their electrical poles they have a professional responsibility to get them down safely. The callousness of animal welfare groups is equally inexcusable. Since they are acutely aware of the intransigence of fire departments and utilities, they should be prepared in advance to make emergency rescues. Ignoring the problem is not going to make it disappear. Although cats have been getting stranded on heights from time immemorial, no one is exactly sure as to why. The explanation most often advanced is that they climb heights in order to escape predators. Once atop a tree or a pole, they either develop acrophobia or lack the savior-faire in order to descend tail first. Unlike margays and fishers, they are unable to rotate their hind paws one-hundred-eighty degrees and therefore climb down head first. 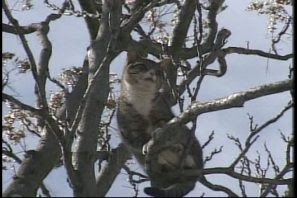 As things now stand, cat-owners and those concerned with animal welfare are pretty much left to either mount rescue efforts themselves or to hire professional tree climbers. Unfortunately, the latter are not always available and when they are they usually charge an arm and a leg; consequently, cats, like the one in Stevinson, and their would-be rescuers, such as Buehler, are going to continue to die. Photos: Adrian Mendoza of The Modesto Bee (Burns), MySpace (Buehler), WJBF-TV (cat at Augusta library), Walter Passarella of Clarington This Week (Hydro One and Twiddy), Isle of Man Today (Mogel), and WTVC-TV (Topper). "Here was this evil thing coming out of the fence, coming down, and within a couple of seconds it had the cat." In addition to being a devout cat-lover, fifty-eight-year-old Ruth Butterworth of Brisbane, Queensland is one courageous individual. She would have to be in order to have gone toe-to-toe with a voracious python in order to save the life of her resident feline, Tuffy. Nevertheless, that is exactly what she recently did even though she was twice bitten and suffered a broken wrist in the process. Thankfully, both she and Tuffy are now recovering and will be fine. "It was almost dark and I saw this silhouette coming down, and I knew what was about to happen to Tuffy," she recalled for the benefit of the Herald Sun of Melbourne on March 10th. (See "Woman Fights Off Killer Python.") "Here was this evil thing coming out of the fence, coming down, and within a couple of seconds it had the cat." Without so much as a second to spare, Ms. Butterworth then went after the snake. "I wasn't looking. I just kept punching until it let go," she said. Tuffy, who prior to the attack had resisted calls to come inside, now gladly scampered for the safety of the house. Although the Herald Sun is conspicuously silent as to the fate of the snake, it most likely slithered away in the grass in order to seek its dinner elsewhere. Unfortunately, Tuffy was not the first and probably will not be the last feline in the Bridgeman Downs neighborhood to be attacked by a python. Days earlier, a cat named Coco owned by Ms. Butterworth's mother was killed by what is believed to have been the same snake. Needless to say, cat owners in Bridgeman Downs cannot allow their cats outside, even in their yards, without supervision. Even then they need to be armed with some sort of repellent or other non-lethal method in order to drive off pythons. Both Ms. Butterworth and Tuffy are indeed lucky to even be alive; the next time around the outcome could very easily be tragically different. The presence of pythons must be taken seriously and that applies to people as well as to the care of their cats. The fraternity of cat-lovers is large, diverse, and passionate. Honi soit qui mal y pense. Photo: Peter Wallis for the Herald Sun. "The South China Tiger has to jump over a big barrier to be saved. They might not jump. Despite all the effort, they might still go extinct. But we must try to help them." 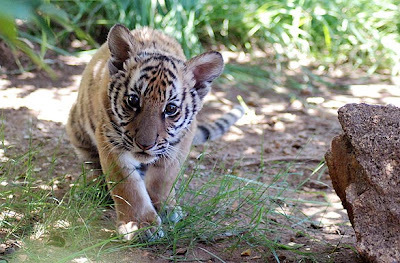 With the South China Tiger either extinct or almost certain to go that route almost any day now, five surviving members that were born in Chinese zoos have been relocated to South Africa in a desperate, eleventh-hour attempt to save the species. At the one-hundred-acre Laohu Valley Reserve outside Philippolis, they are being bred and taught to fend for themselves in the wild. Once habitats with sufficient game have been established in China, their offspring will be returned and released while they will remain in South Africa and continue to breed. 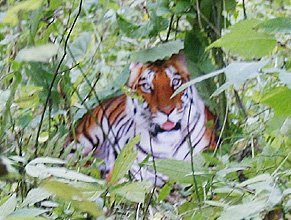 Between 2003 and 2007, four tiger cubs and one five-year-old adult were relocated to Laohu Valley. Unfortunately, one of the cubs, Hope, developed coronary and respiratory difficulties and died about two years after her arrival. In November of last year a tigress named Cathay, who had earlier mated with a tiger dubbed TigerWoods (sic), gave birth to a still unnamed cub. (See photo above.) This marked the first time that a South China Tiger, long thought to be the stem species of all tigers, had been born outside its native land. As things now stand, once two pairs of unrelated cubs are bred and reared at Laohu Valley they will be returned to China and released into reserves planned for Jiangxi and Human provinces. Before that can happen, however, authorities in China must create reserves, stock them with live game, and relocate the residents now living in those areas. Moreover, the project will not come to an end with the reintroduction of the cats to the wild. Au contraire, the Chinese authorities will have to be vigilant in protecting them from individuals intent upon doing them malice aforethought and the breeding and training program in South Africa will have to continue indefinitely. Even if conservationists in China do follow through on their end of the deal, the obstacles confronting the cats are formidable. First of all, there are difficulties in getting animals born in captivity to breed whether that be in a zoo or a reserve. For instance, a tiger named Three-Twenty-Seven, who arrived at Laohu Valley last September after having spent the first five-years of his life in a zoo, has yet to mate. There are also nurturing issues. For example, when Cathay gave birth she failed not only to lick dry her male offspring but also to warm him. This necessitated the cub being taken from her and bottle-fed by attendants. (See photo below.) He will, however, be returned to the reserve once he reaches the age of four-months. It is not clear whether tigresses born in captivity have lost the nurturing instinct or if Cathay is an anomaly. Should the former be the case, this project is most likely doomed to be a colossal failure. It is encouraging nonetheless that she did not attempt to harm the cub in any way. Not only must the tigers be weaned off of handouts, but more importantly they need to first overcome their fear of the outside world. Three-Twenty-Seven was even terrified of the grass blowing in the breeze when he was first turned loose at Laohu Valley. Although some people may laugh, that is quite understandable considering the constraints that captive animals are forced to endure. Their tiny cells, keepers, and meager food rations are pretty much all that they know of the world. In a sense, they are far worse off than the hoi polloi that Plato describes in The Republic as living in a cave. Consequently, being set free even at a specially designed reserve like Laohu Valley can be extremely traumatic for the tigers. Moreover, it highlights the difficulties involved in releasing these animals in China. In nature, tigers and all other animals are taught to hunt by their parents whereas those born in captivity must be taught their predation skills by humans. Not surprisingly, there have been some notable setbacks along the way. Par exemple, Hope was bitten by a baboon while another tigress known as Madonna became dehydrated while hunting. "There's no exact recipe. They don't have the mother to teach them to pluck the feathers off a guinea fowl or break open a springbok," former South African game warden Peter Openshaw, who is now working for Li, told the velvet coffin in the article cited supra. "They have to learn by trial and error. The first couple of kills have to be quite easy. Then you make the process more difficult." The flat largely barren plains of South Africa also create obstacles of their own. With limited cover, the cats must learn to stalk and then ambush their prey. Nevertheless, the skills that they now are learning should stand them in good stead once they are released into China's mountainous regions. It is unclear, however, if the cats will be able to adapt to the cold and snow of China after having spent their entire lives in either zoos or warm South Africa. If either their fur fails to grow or their immune systems are unable to adjust to the elements and new diseases the tigers are not going to survive for very long. It therefore would have been more appropriate to have conducted this experiment in China had either a suitable habitat or the expertise been available. Besides, transporting the animals between China and South Africa is in itself stressful for them. Judy Mills of Save the Tiger Fund also has repeatedly hurled virulent salvos in Li's direction that have questioned both her abilities and motivations. Believing as she does that all resources and expertise should be concentrated on saving Amur, Bengal, and Indochinese tigers, she accordingly has written off the South China Tiger as a lost cause. Even Openshaw has his reservations about the viability of the project. "You just have to persevere and put your head down and keep on going. At least we're doing something. I'd rather say, 'Well, we didn't save the animals from extinction, but gee, we gave it our best shot'," he confessed to the Times. Li, who has already poured more than twelve-million of her own moola into this project, is undaunted by either the criticism or obstacles. "The South China Tiger has to jump over a big barrier to be saved. They might not jump. Despite all the effort, they might still go extinct. But we must try to help them," she said. To say that the tigers are in need of help is a gross understatement; what they actually need is nothing short of a miracle! For instance, researchers at the University of Exeter recently concluded that tigers and other large carnivores reintroduced to the wild only have a thirty-three per cent chance of survival. 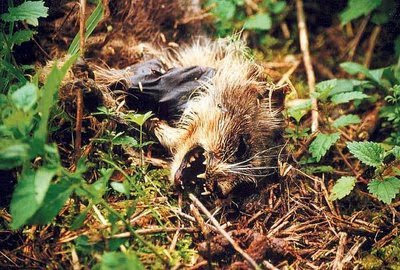 Predation by hunters and motorists claims the lives of fifty per cent of them while the remainder succumb to hunger and disease. Some of them also fail to mate and therefore do not contribute anything toward reestablishing their respective species. Moreover, their lack of fear of humans is a hard obstacle for captive-bred animals to overcome. The precipitate decline of South China Tigers was one of the great crimes of the twentieth century. Fifty years ago, there were at least four-thousand of them but Mao fiendishly branded them, along with leopards and wolves, as pests which led to their wholesale slaughter. The animals also have been hunted for their lucrative pelts and various body parts, the latter of which are a staple of traditional Chinese medicine. Development has additionally diminished their habitat and food supply. Although there are between sixty and seventy of the tigers living in zoos in China, there has not been a confirmed sighting of any of them in the wild in about thirty years. Even the most optimistic experts estimate that there could be no more than twenty-five to thirty of them remaining, which is far too few in order to make the species genetically viable. It now appears that Zhou forged the photograph on a computer and that local officials conspired with him in perpetrating an elaborate hoax in order to increase tourism in the area. (See photo above.) Zhou was even publicly hailed as a hero and rewarded with $2,666 for the photograph. If the South China Tiger becomes extinct in the wild it will join its Balinese, Caspian, and Javanese cousins who have preceded it into the dustbin of history. That would leave only Amurs, Bengals, Sumatrans, Indochinese, and Malayan tigers and the long-term outlook for them is not particularly promising. 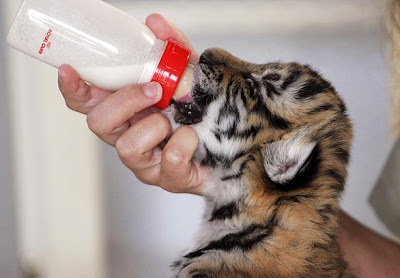 Photos: Robyn Dixon of the Los Angeles Times (tiger cub) and Save China's Tigers (Zhou's tiger). The road leads back to you." It is every cat owner in New York City's worst nightmare. You are riding the subway and your cat somehow escapes from its carrier and disappears in an Augenblick into the labyrinth of tunnels, darkened corridors, and uncountable nooks and crannies that make up the sprawling underground system. This sad story was immediately picked up by Gotham's media outlets and although a search was made of the tracks by MTA officials, no trace was to be found of the cat. After a while both Phillips and the general public gave up hope and the story disappeared from the tabloids. Georgia had become just one more victim in a city chock-full of victims and sad stories. After all, it is rumored that there is a broken heart for every light on Broadway. Hope was rekindled on February 13th when twenty-six-year-old Con Edison worker Christopher Cuddy spotted Georgia wedged between the tracks but was unable to rescue her. That was when MTA flagman Mark Dalessio and track inspector Efrain LaPorte joined the hunt. A few days later on February 16th the workers spotted the cat below the rails at Fifty-Fifth Street and Lexington Avenue. Sergeant Daniel Green and Officer IIker Ozuk of the transit police were summoned and climbed down and retrieved Georgia. "As I was walking down the track, I was making cat sounds, 'meowing'," is how Dalessio later described his successful modus operandi to the New York Daily News on February 17th. (See "Georgia Rules! 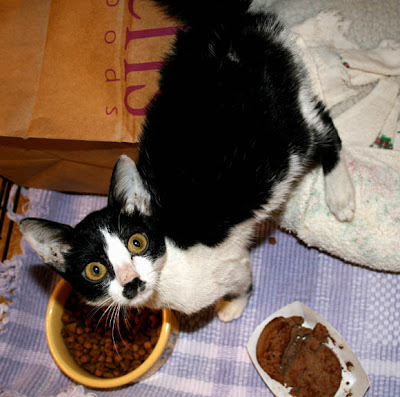 Kitten Found After Scampering into Subway Twenty-Five Days Ago.") "I heard a 'meow' back and I thought it was LaPorte. I thought, 'Wow, LaPorte is inspired'." It was not, however, his co-worker; it was instead Georgia cowering in a foot-deep drain between the tracks. Dalessio then extended his hand and Georgia gave it a lick. "It was kinda cute," he told the Daily News. "I can imagine the fear the cat had with trains going by." A trip to the vet revealed that Georgia had sustained a broken rear leg and a scratch on her nose but otherwise was okay except for being dehydrated and a tad skinnier. The emotional scars that she sustained during her hellish twenty-five-day ordeal will remain with her for a long time, however. "A subway tunnel is a very dangerous place, especially with the third rail," NYC Transit President Howard Roberts later told the Daily News. "I am very happy that we found the cat before she used up all nine lives." For their outstanding work Dalessio, LaPorte, and Cuddy will split a $1,500 reward offered jointly by the Mayor's Alliance for NYC's Animals and City Critters. Cuddy, however, is planning on donating his share to the ASPCA. A far better option would be to avoid the subway system altogether when traveling with pets. The underground is a noisy, dirty, and dangerous place where almost anything can, and often does, happen. The ear-splitting noise, screeching trains, muggers, and throngs of jostling commuters are traumatic enough for humans let alone an animal locked inside a box. Since la grosse pomme boasts an abundance of bus and car service between the Bronx and Manhattan there was not any need for Phillips to have put Georgia's life in jeopardy in the first place. The Bronx, moreover, has everything that a cat may need whether it be veterinary treatment or grooming. Finally, the fact that Georgia was rescued in the vicinity of where she was lost proves once again that cats are territorial. Therefore, individuals searching for a lost cat should always concentrate their efforts near home or, as in the case of Georgia, the place where the cat was last seen. Photos: Ashley Phillips (Georgia) and Joyce of the New York Daily News (Phillips and Georgia). "It's more humane, especially if they're ill, to dispatch them with a bullet than to let them suffer, languish, or starve." Penal institutions are a favorite dumping ground for individuals who unconscionably abandon cats. Despite the formidable challenges presented by predation, hunger, disease, and hit-and-run drivers, a good portion of these brave and hardy animals survive and their numbers generally increase over time. 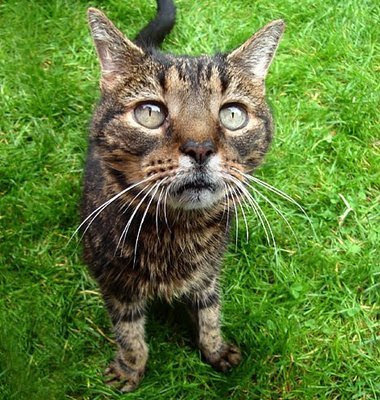 Some forward-looking institutions with an ounce or two of compassion institute TNR programs in order to stabilize the population while others are deaf, dumb, and blind to any option except trap and kill. Few prisons are, however, so brazen as to have their resident felines shot on sight. Predictably, Chavez County Animal Control informed prison officials that their only options were to either shoot the cats or trap and bring them in for the shelter to kill. Worst still, this needless and inhumane slaughter was endorsed by the phony-baloney Animal Welfare Alliance of nearby Roswell. Aside from the impossibility of determining the health of a feral cat from the viewfinder of a rifle, it would be interesting to know if Hathcoat would extend her neo-fascist policy to humans if she were ever given the opportunity. Would she systematically dispatch the poor, sickly, disabled, and elderly to the devil with a bullet? Moreover, what about anyone who dared to disagree with her or stood in the way of her ambitions? Although no reason has been given, the facility has since had a change of heart and apparently is going to give a modified version of TNR a try. According to KOB-TV, the remaining cats will be trapped and those deemed healthy will be sterilized and returned to the prison. 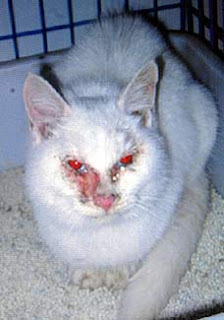 Sickly cats still will be killed although the mode of execution has not been specified. Presumably since they will already have them in hand the prison will not shoot them. Of course, it is conceivable that officials might turn around and release them in order to give their sharpshooters a little more target practice. Opened in 1978, Roswell is a level II facility that houses three-hundred thirty-four inmates. (See photo above.) Heretofore known principally for an alleged UFO landing in 1947 and as the birth place of Demi Moore, Roswell now can add the gunning down of defenseless cats to its otherwise lackluster curriculum vitae. Officials at Utah State Prison in Draper also used to be avid practitioners of trap and kill. All of that began to change some years ago when an unidentified inmate complained about the killings to substance abuse counselor Julie Cox. Without hesitation, she enlisted the assistance of No More Homeless Pets in Utah and together they were able to convince the Department of Corrections to scrap trap and kill in favor of TNR. The petit fait that it required a convicted felon in order to put an end to these senseless killings raises the uncomfortable specter that perhaps the police and prosecutors have got things all wrong and that society might be better off if some of those individuals on the outside were to switch places with some of those on the inside. If prisons exist primarily to protect society from violent offenders, then certainly the cat killers at Roswell and their cheerleaders from the Animal Welfare Alliance should be incarcerated. The same holds true for PETA, the Humane Society of the United States, the American Veterinary Medical Association, and any other group that champions the killing of animals. 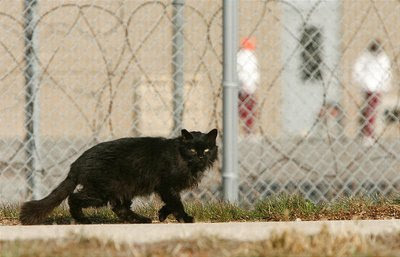 Since its inception, TNR has successfully reduced the prison's feline population from hundreds to dozens. (See photos above and below.) The inmates care for the cats and even construct shelters for them while Cox and others buy food for them out of their own pockets. 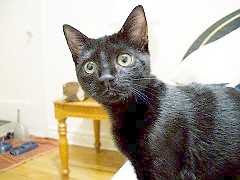 (See photo further down the page of a cat in one of the shelters.) 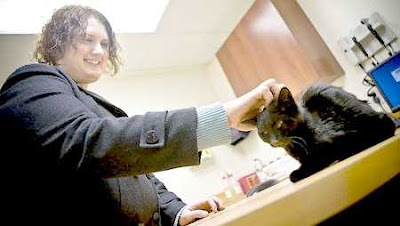 No More Homeless Pets meanwhile provides medical care for those cats that require it. In addition to being patently inhumane, the rescue group's Holly Sizemore insists that trap and kill simply does not work. "Those few cats left start breeding like crazy and over-breed in a vacuum effect," she told the Deseret Morning News in the article cited supra. 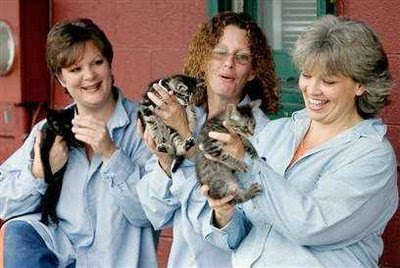 Caring for the cats also has proven to be therapeutic for the inmates. "It gives them a sense of responsibility and compassion," she added. "Some of these big guys are like, 'You'd better not mess with the cat.' They really love them. A lot of us understand how pets give us unconditional love, and it's not something you find in a prison." Cox concurs. "It's good for them. They start caring for something else besides themselves." At the Pocahontas Correctional Unit in Chesterfield, Virginia, a small group of females inmates recently took in and cared for more than two dozen cats that were left homeless by Katrina. 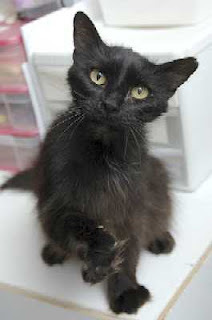 Sporting such geographically appropriate monikers as Katrina, Gumbo, and VooDoo, the cats arrived at the facility in September of 2005 following a grueling twenty-hour truck ride from an overcrowded shelter in Jackson, Mississippi. "It makes us feel like we can be part of something -- to be a part of the storm -- to help out," Brickey told MSNBC on October 19, 2005. 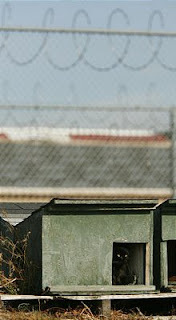 (See "Inmates Welcome Cats Orphaned by Katrina.") "We are so secluded from the world and there's somebody waiting on their pets. And while I might never meet them, I took care of them while they're getting their life together." "Had I been at home, I probably would have gone down and helped," Kilgore added. "This gives me responsibility and gives me motivation to go out and live a so-called normal life." Quite naturally, the inmates over time became attached to their charges. In Brickey's case, the object of her affection was a kitten named Scarlett. Although she was so traumatized upon arrival that she would hardly allow anyone to touch her, she soon grew accustomed to cuddling with her caretaker. "When I look at her, I see that after all this time, I'm not so wild anymore -- and she's not so wild anymore," Brickey confessed to MSNBC. Pocahontas, which already had a fledgling nurturing plan in situ for homeless cats before Katrina, is far from being the only penal institution to have taken in cats and dogs displaced by the deadly storm. For instance, more than two-hundred animals were given temporary sanctuary in a converted dairy barn at Dixon Correctional Institute in Jackson, Louisiana. While penal institutions bear faint resemblance to a loving home, they are no doubt far preferable to either extermination at a shelter or being left to fend for themselves alone in the woods. 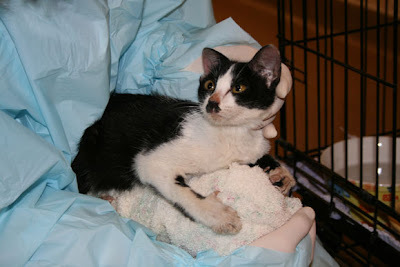 Food, shelter, and veterinary care are at least available at most responsible facilities. Prisons also profit mightily from their presence. Not only do the cats provide free rodent control but they also help to secure grain stores. Their presence also has an undeniably positive impact upon the inmates and that makes the job of running these horrible facilities considerably easier. Most important of all, prisons that adopt a humane approach to homeless cats are demonstrating to the world that all cats have an inalienable right to life and liberty. Photos: KOB-TV (Roswell kittens), New Mexico Corrections Department (Roswell facility), Jeffrey D. Allred of the Deseret Morning News (Utah State Prison cats), and Steve Helber of the Associated Press (inmates and cats at Pocahontas).